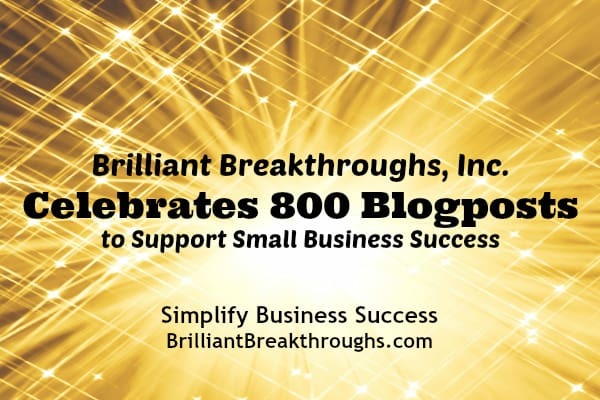 Brilliant Breakthroughs celebrates 800 blogposts to support your small business success - Brilliant Breakthroughs, Inc.
We celebrate publishing 800 blogposts to serve Small Businesses! Is YOUR Business successful? 800 blogposts isn’t the easiest things to create. OK I take that back, it could be if it were rantings of fluff, which this blog isn’t at all. Designing a continuous message to serve you, to support YOUR Business Success, has been a grand journey for me. Showing up to write 3 weekly training or coaching session type blogposts for over 5.5 years has been a daunting accomplishment… and challenge! Even though it was over 5 years ago, I remember the conversation clearly. My original webmaster told me I “need to write 3 blogposts a week to improve my SEO score”. Of course, I debated this with him. That’s even funnier now because I thought I knew a lot of SEO back then. He further explained why I needed to do this. Today we would call it “amping up the Google juice” for a new site. When I surrendered into my “yes” I told him I didn’t think I could do 3 blogposts a week. He told me to start with one, then quickly move up to two a week. Then after feeling comfortable, move into creating 3 blogposts of what other small business owners want and need to hear about. Now, in one aspect this seems daunting and in another it didn’t. I just had to write something that a small business owner would appreciate. How hard could this be? I am one of them! Several months ago it happened – I hit a roadblock. My shizzle had lost its fizzle. It was harder to create a good and purposeful blogpost for you than when I first started! What happened? I felt my blogpost capability lost its luster! How was I going to continue? I speak about the power of developing a blog for credibility and authority in the marketplace. Heck, I even train folks with a framework to develop and write this type of blog! I couldn’t just stop, or could I? Wow, I hit burn-out big time! I needed a break. What happen next? My metrics started going crazy with my viewership going through the roof! Just when I wanted to quite the most, the greatest opportunity to serve the greatest number of people came forward and started reading blogpost after blogpost. What was I to do? When I started this blog, I said “I was in it to win it!” So, I couldn’t stop. I doubled down and pushed myself to deliver even hotter content to you! Why would I stop? I spent years researching blogging. Back in the day there wasn’t much high value blogging occurring and bloggers weren’t figuring out the secret sauce of how to utilize a blog to create influence, credibility, or even monetization. Yes, social media and SEO were just little peanuts on the scene back then. Over the years, I invested several thousands of hours researching, studying, and learning about this “blogging and SEO thing”. Most of the information revealed the same information – typically lame or mundane. There surely weren’t the great teachers of blogging back then as there are today. Unfortunately, those teaching impactful blogging techniques are few and far between. Remember the burn-out thing I mentioned? In the middle of doubling down, I made a great decision to assure high quality and practical content would continue here. I decided that I’m going to do a shift with my blogposting, once I hit 800 blogposts. On Monday you will see a high value original writing. These blogposts will hold true to form of sharing success strategies and tips for Small Business Owners and YOUR Business Success we’ve always delivered. Then on Thursday I will post either a new Business Movie Review (there are over 60 movies for you to review) or a revitalized (updated) blogpost from years ago that would add value to YOUR Business Performance. FIRST: YOU! It serves Small Business in a practical and tactical manner. 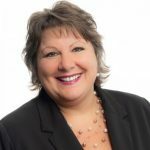 I help Small Business Owners simplify strategies and align actions so they can build profitable and peaceful businesses, while stepping into their potential. SECOND: This blog helped me develop expressing my expertise. I had no idea what valuable wisdom I held for my clients and customers until I needed it to pour out of me several times a week. THIRD: Writing this blog helped me hone in on my ability to construct excellent frameworks to effectively teach my clients and customers. FOURTH: By showing up 3 times a week, I learned the power consistency and execution has in the marketplace, as well as how it impacts a bottom-line. FIFTH: Most importantly, I now understand the importance of having a message to serve and finding a platform that is accessible to all. THANK YOU! I appreciate you traveling this journey of continuous improvement for both our businesses’s success thus far. I assure you I will continue to show up with cutting edge strategies and practices I’ve learned, curated, taught, and practiced to serve you in the grandest fashion possible! Whew-hoo! Congrats to you for finding a source that serves you in fulfilling YOUR Business Goals. In the comment section let us know what you want to learn about to grow YOUR Business. Guide & Simplify YOUR Business Brilliance! support Profitability & Peace for Small Business. p.s. What can you to improve YOUR Business’s Visibility? An excellent blog sharing your journey in blogging Maggie. I for one read and learn from you with each one. Thank you for all the value you bring! Thanks for the compliment and support Claudia. I look forward to bringing you more high value strategies and right actions to support YOUR Business’s Success!